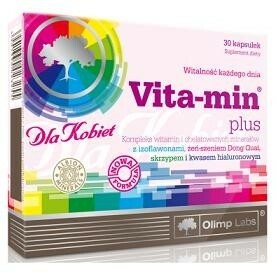 Olimp Vita-Min Plus for Women is an innovative, comprehensive combination of vitamins and highly absorbable, Albion ® chelated minerals, which helps to cover the demand for essential micro-nutrients, enriched with hyaluronic acid, soy isoflavones, ginseng, dong quai and horsetail. Chelated minerals, used in this supplement, are manufactured by leading raw pharmaceutical materials supplier - ALBION Laboratories company. They are completely safe when applied, do not irritate the stomach and do not hinder the absorption of other minerals. Horsetail extract improves the appearance of skin, hair and nails, stimulates hair growth and strengthens them. Hyaluronic acid is a natural biopolymer, an essential component of building the extracellular matrix of the dermis, which, thanks to its water-binding properties, helps to maintain good condition of the skin and its youthful appearance. 1 capsule daily, drinking large amount of water or otherwise after consultation with a physician.